First editon of Johnson's map of Washington D.C.
A beautiful first edition example of A. J. Johnson's 1861 map of Washington D.C. and Georgetown. Offers a fascinating snapshot of the nation's capital shortly after the outbreak of the American Civil War. Shows the city in considerable detail with color coding according to ward. Notes numerous important buildings including the Capitol, the Smithsonian Institution, the White House (not yet called the White House), the Washington Monument, the National Observatory, the Navel Yard, the Poor House, the City Hall, and others. The city's famous grid and ray structure appear according to L'Enfant's brilliant plan. Georgetown appears as a separate entity in the upper left corner with Georgetown College noted just outside the city border. Also shows proposed landfills and extensions to the east side of the city into the east branch of the Potomac River. Though ostensibly based on Colton's map of Washington D.C. published in 1855, Johnson's add a number of updates and embellishments including three engraved views. The grand dome of the Capitol Building is shown complete in the upper right hand quadrant of this map, though in fact it was only partially built when this map was issued. The Washington Monument appears in an earlier unrealized conceptualization in the lower left quadrant. Features the strapwork style border common to Johnson's atlas work from 1860 to 1863. This is a first edition of this map. 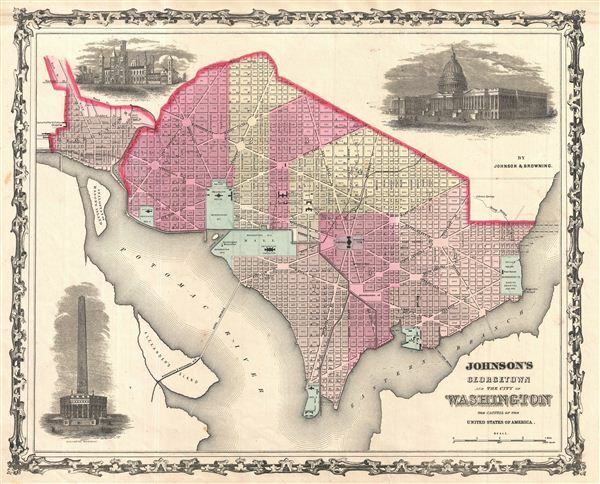 Though Johnson and Browning did publish an atlas in 1860, their first, the Washington D.C. map did not appear until the second edition published in 1861. Published by A. J. Johnson and Browning in the 1861 edition of Johnson's New Illustrated Family Atlas. This is the last edition of Johnson's Atlas to bear the 'Johnson and Browning' imprint. Very good condition. Minor spot lower left quadrant. Blank on verso. Even overall toning.